Description: This northbound followed an intermodal out of the yard shortly after it cleared the block. Description: An ethanol empty is parked on the new siding at Flint. Description: Snaking its way through the curve .. Description: 2nd C45ACCTE built with the new dynamic brake system. Description: Theres my Truck off to the left of the Train. Description: Three UP trains meet at the westend of UP's Englewood Yd. Description: Union Pacific. 7601 northbound approaching the Neumarkle Rd crossing. 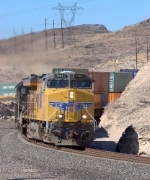 Description: UP ballast train descends from Tehachapi at Woodford siding. This train also had two DPUs on the rear. Description: A very colorful motive power consist leads train 135 up Yadkin Hill towards Spencer and Salisbury. The Reading heritage locomotive was a real treat and there were many railfans along the line to capture this train.